A special thank you to NetGalley and Little, Brown and Company for an ARC in exchange for an honest review. In 1940, eighteen-year old Juliet Armstrong is reluctantly recruited into the world of espionage. Sent to an obscure department of MI5 she is enlisted to transcribe the conversations that take place in a bugged flat between Godfrey Toby, an MI5 agent, and a group of suspected fascist sympathizers. At first the work seems dull, but then it becomes terrifying as Juliet is thrust into a world of secrets and code. After the war ends, she thinks that her service is over that the event she transcribed are left in the past. Fast forward ten years and Juliet is now a radio producer with the BBC. Even though her past seems like a lifetime ago and Juliet has resigned herself to her more mundane life and work, she is unexpectedly confronted by figures from her past. Haunted by these relationships and her actions, Juliet cannot escape from the repercussions of her work. Left with no choice, she is pulled back into a life of espionage. Atkinson is such a gifted writer. I had the privilege of attending an event where she spoke at length about her research and writing process for Transcription. Her writing is rare in that she brings humour to her narrative in such a subtle way. Much of this is accomplished through Juliet trying to make sense of what she is listening to as well as through her naiveté. Juliet is Atkinson's vehicle to make the events fictional. She is "the girl". Atkinson has described her as being "a smart character, but with an incredibly active imagination". In typical Atkinson fashion, the reader is treated to shifts in time and plot (things don't unfold sequentially). You can certainly tell that she has done her research, the story that emerges is nothing short of original and extraordinary, and I encourage you to read the author's notes. 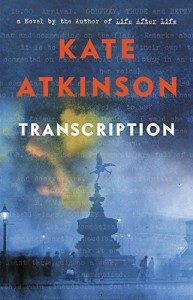 Transcription is a layered work of deception and consequences and a thrilling literary read.